The Philadelphia Phillies have been stuck towards the bottom of the National League standings for close to a decade, but a new era could be on the horizon. 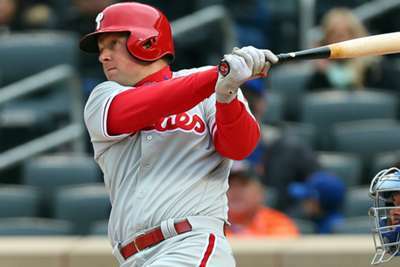 With the Mets pulling off a heroic win late Sunday, the Phillies still trailed their NL East rivals by three games, but any sort of division or wild-card chase this season would be a bonus for long-suffering Phillies fans. Pirates outfielder Starling Marte went five for five with four runs scored and a solo home run in a 7-3 win over the Marlins. The offensive outburst helped Marte climb over .300 for the season. After missing most of last season with a PED suspension, Marte is poised for a bounce-back campaign. Orioles sluggers Chris Davis and Adam Jones continued their early-season struggles in a 3-1 loss to the Red Sox. Davis went 0 for four with three strikeouts, dropping his average down to .132, while Jones went 0 for four and is now batting just .221. Noah Syndergaard showed off nasty movement on a breaking ball. Pittsburgh continue to surprise in the National League Central, while the Rockies try to contend in the deep NL West. Pitching woes have plagued the Rockies, but guys like Charlie Blackmon and Nolan Arenado need to start hitting, too. Arenado will be suspended for this entire series.